rooftop terrace/restaurant of the department store La Rinascente. If your first introduction to Sicily is Palermo, don't be discouraged by the litter-strewn highway from the airport and the city's gritty outskirts. You'll be pleasantly surprised by the town's ancient center. During its nearly 3,000 year old existence, Palermo's strategic position in the middle of the Mediterranean attracted an almost endless stream of invaders, including the Phoenicians, Carthaginians, Greeks, Romans, Saracen Arabs, Norman crusaders, Swabians, French and Spanish Bourbons. The result is a fascinating blend of architectural styles and the appealing fusion of ingredients used in local dishes. raisins, saffron threads and wild fennel. To revive our waning energy after the early morning flight from Paris, our first stop was a pasticceria for cappuccinos and an assortment of local pastries. In between bites of cannolo (that's the singular form of cannoli! 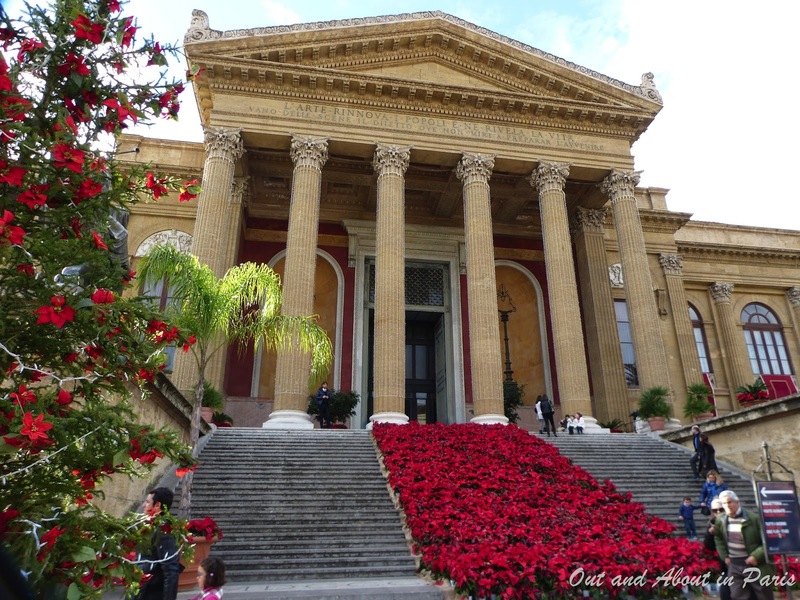 ), Stéphane read about the most important sights: Palermo's Norman palace, the Palazzo dei Normanni; the city's sumptuous opera house, Teatro Massimo; and the nearby Cattedral di Monreale with its tranquil cloister. 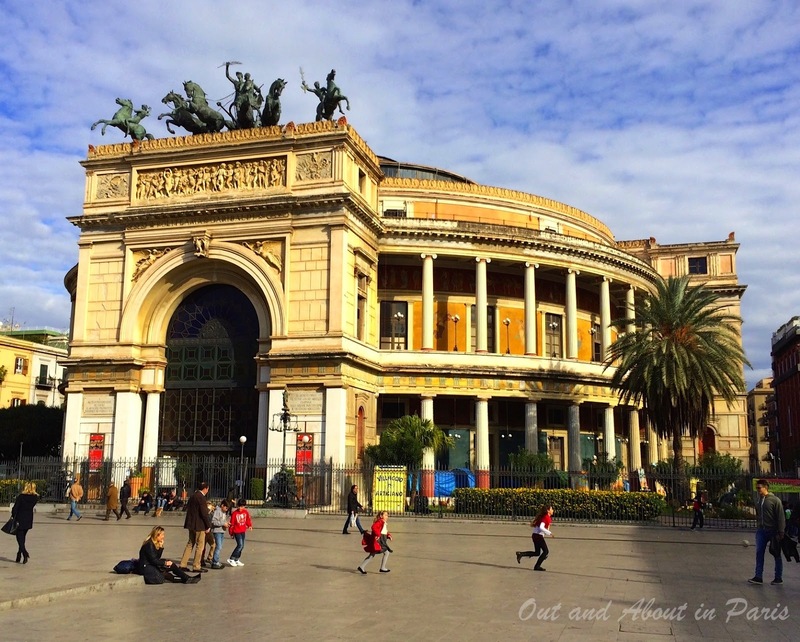 The Teatro Massimo is Europe's third-largest opera house and one of Italy's most prestigious. The closing scene of The Godfather: Part III was filmed here. 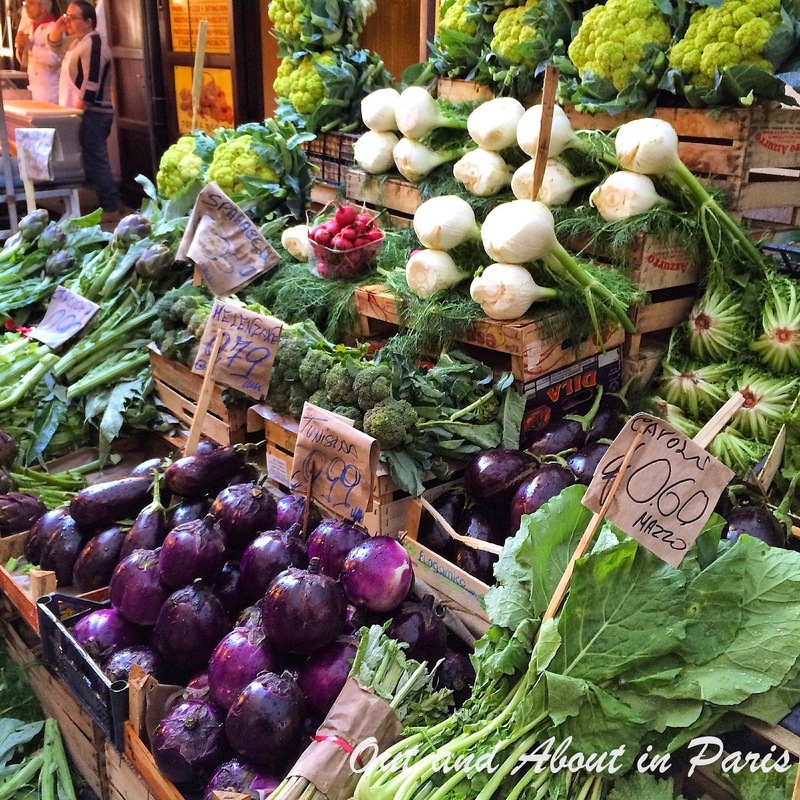 Rather than spend the afternoon indoors, we decided to explore the tangled alleys and vibrant street markets. 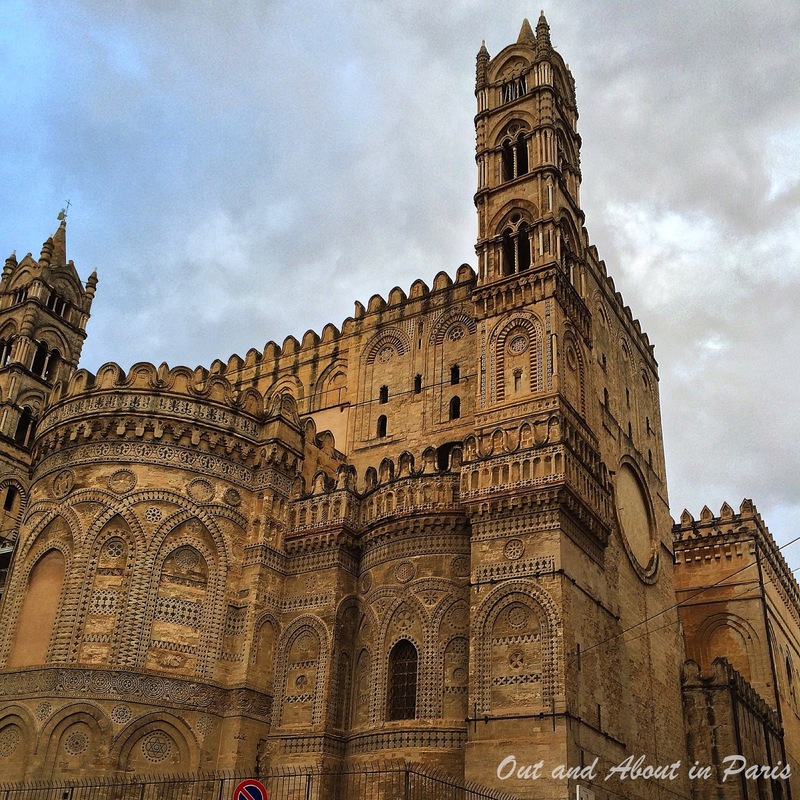 Our wanderings led us to the imposing Palermo Cathedral. A prime example of the Arab-Norman style unique to Sicily, decorative Islamic-inspired overlay merges with impressive bell towers dating from the 14th century. Built on the location of a 9th-century mosque, which was constructed on a former chapel, one of the cathedral's columns still bears an inscription from the Koran. Palermo Cathedral. Construction began in 1184. For an offbeat and somewhat macabre experience, visit the Capuchin Catacombs of Palermo. More than just piles of bones, it's also a fascinating historical record. From the seventeenth to the nineteenth century, interment in the Capuchin Catacombs was a status symbol for the town's wealthy citizens and celebrities. Last wills and testaments contained specific instructions about the particular clothes that luminaries wished to wear and how often their attire should be changed. 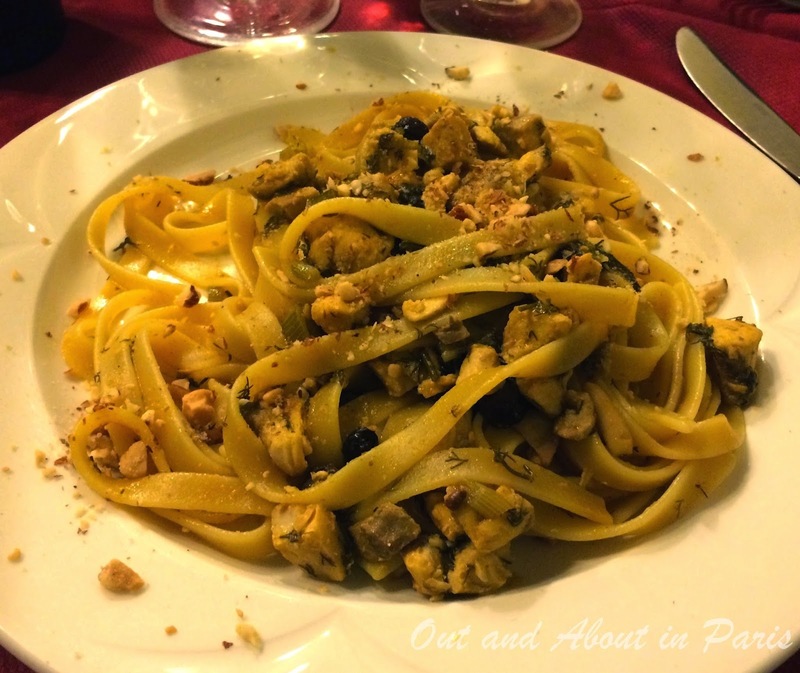 While all of our meals in Palermo were delicious, the most memorable was lunch at Trattoria Basile. Crowded with locals, this place can be a bit intimidating if you don't know how the system works. The first step is to pay the cashier for your lunch, which is difficult when you 1) don't know what's available to eat and 2) don't speak any Italian. Fortunately, the woman at the register helpfully suggested that we try some local specialities: pane e panelle, Palermo's famous chickpea fritters; pani ca meusa, a bread roll stuffed with sautéed beef spleen; arancini, stuffed rice balls coated with breadcrumbs and fried. After you've paid, you'll receive a ticket with a number. If you ordered antipasti or pasta, take your ticket to the window by the kitchen to make your selection. Listen for the server to call your number in Italian to have the rest of your food delivered to your table. 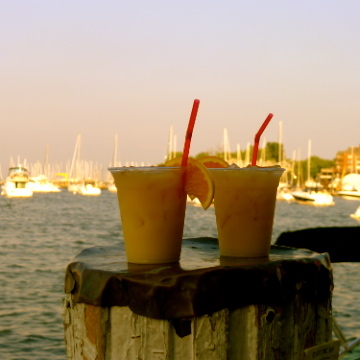 It's a fun, chaotic kind of place not recommended for those wanting a romantic or tranquil dining experience. But you can't beat the price. Our family of four had a spread of tasty food for 15 euros. There was so much that we couldn't finish all of it! The Ai Cavalieri Hotel (4*) is reasonably priced and centrally located. 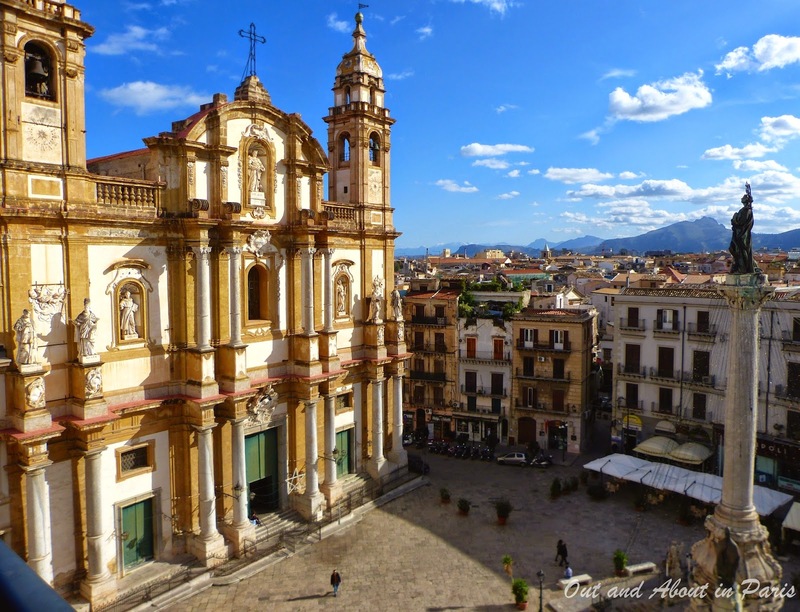 Related post: Planning a trip to Sicily? Here are some helpful recommendations to get you started! Local vegetables at the heart of Sicilian cuisine.